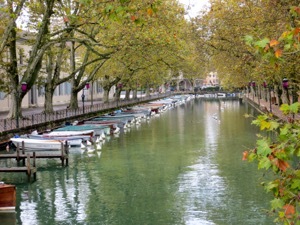 You're never far from the water in Annecy, with the lake and the rivers and canals. 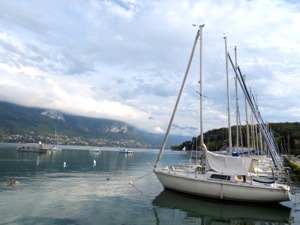 Annecy has an enviable situation, on the shores of the beautiful Lac d'Annecy, and surrounded by nearby mountains. Although the Vieille Ville focuses more on the canals and the River Thiou, the Hôtel de Ville and other central parts of the town are lakefront. Les Jardins de l'Europe is a large pedestrian zone right on the lake. With its beautiful plantings, walkways, and viewpoints, it is a lovely place to stroll and enjoy the beauty of the lake and the surrounding area. The Pont des Amours (Bridge of Love) connects the Jardins with the larger Champ de Mars. The Pont des Amours offers beautiful views of the Vassé Canal, a nearby carousel, and the lake and its fountains. On weekends the Champ de Mars is full of families and friends playing football (soccer), picnicking, bicycling, skating, and enjoying the waterfront. The Avenue d'Albigny, lined with century-old plane trees, provides a great place to walk and enjoy the views. From the Pont des Amours, it's less than a mile's walk (about 1.3 kilometers) to the Imperial Park and Palace. The Imperial Park and the Parc Charles Bosson offer playgrounds and an aviary, as well as beach access. Be aware, however, that you must pay to use the beaches in Annecy. There are plenty of places to walk, and there is a large free parking lot nearby. There are also several areas for sailboats and other craft. The Imperial Palace is a luxury hotel that opened in 1913 and was renovated in the 1980s. In addition to the hotel, it houses a casino and convention center. Since I love to stroll by the water, I was surprised at first to see how few places there are to access the lake in Annecy. You can walk along some of the quais, but you often need to cross major roads to get to the waterfront. There are some other small beaches outside of the town of Annecy that offer limited opportunities for swimming and sunbathing. A bike path facilitates access to the west side of the lake. Above, Vassé Canal as seen from the Pont des Amours. Below, Sailboats on the lake.